Stuffed Animal Sleepover at the Library is Back! 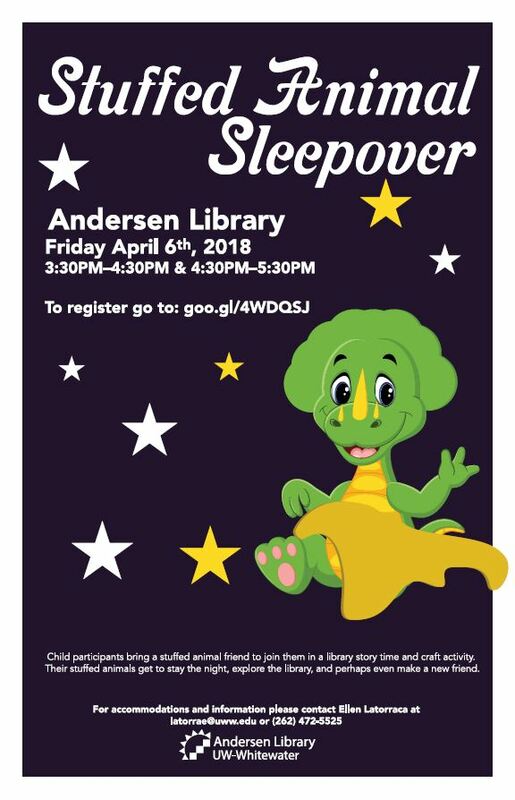 UW-Whitewater students, staff, faculty and Children’s Center families accompanied by a child 6(ish) years of age or younger, are invited to join Andersen Library for the 6th annual Stuffed Animal Sleepover on Friday, April 6th. Child participants bring a stuffed animal friend to join them in a library dance party, story time, and craft activity. Their stuffed animals get to stay the night, explore the library, and perhaps even make a new friend. (Psst! Word has it there are dinosaurs roaming about the library after hours.) Children pick up their stuffed animal and a memento of their stuffed animal’s night-time adventures on Saturday, Sunday, or Monday. Note: Children need to be accompanied by an adult, but the library will provide chaperones for the stuffed animals’ overnight stay. Want to know more? See our post from last year’s event. Have questions? Contact Ellen, the Education Librarian at 262-472-5525.